How real estate barons and investment bankers plotted the destruction of working-class New York. The streets of East New York are lined with hair salons and fruterias — and coming soon, a massive office complex. 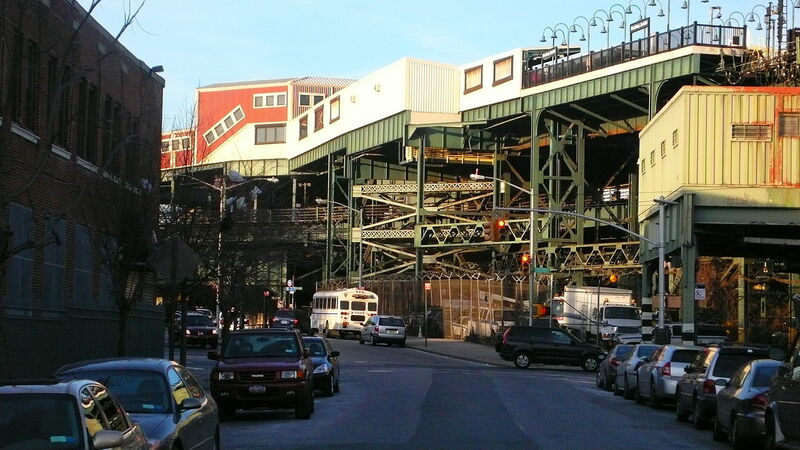 New York City officials are planning an intensive overhaul of the area around Brooklyn’s Broadway Junction train station, and office space is a centerpiece of the revitalization plan. “Bringing modern office space to East New York will help drive its continued growth as a job hub and bring hundreds of new private sector jobs to the neighborhood,” said Economic Development Corporation president James Patchett. By now, it’s a song New Yorkers know by heart. Twenty-five years ago, the hidden origins of New York’s office-building addiction were unearthed by the radical journalist Robert Fitch in his classic book The Assassination of New York. New York, Fitch contended, once had a diverse industrial economy, and was therefore a place where people across the class spectrum could afford to live and work. But over the course of the twentieth century, city elites undiversified it — on purpose. Blue-collar industries were replaced with white-collar ones, with the goal of driving up land values. Why? Because city elites owned the land. New York used to be a place where fishmongers, seamstresses, and dock workers lived a stone’s throw from Rockefellers. The wealthy vigilantly guarded their patrician institutions from proletarian interlopers, but they still preferred to live in New York, Fitch notes, because it was an energetic and culturally vibrant place to be. Some of the poorest people live in conveniently located slums on high-priced land. On patrician Fifth Avenue, Tiffany and Woolworth, cheek by jowl, offer jewels and gimcracks from substantially identical sites… Such a situation outrages one’s sense of order. Everything seems misplaced. One yearns to rearrange the hodgepodge and put things where they belong. The 1929 plan assembled by these powerful interests, acting as a body called the Regional Planning Association (RPA), involved a thorough rezoning of Manhattan: the garment district, gone, the slaughterhouses, gone, even the port — one of the finest in the world at that point — gone. In their stead would go office buildings and upscale homes for the professional people who worked in them, all of which would yield exponentially greater rent returns for the capitalists who owned the properties, and could be sold at increasingly staggering prices. Over the course of the next two decades, New York lost a quarter of a million manufacturing jobs. Meanwhile, occurring simultaneously with this expulsion of the working class, the city’s land values rose from $20 billion to $400 billion. This preparatory work came in handy in the 1950s, when local capitalists intensified their efforts to purge manufacturing from the city. For instance, notes Fitch, the Rockefellers had been amassing a small empire on the periphery of Rockefeller Center when they came up against pockets of manufacturing. So they underwrote a study by the RPA — with help from Harvard — that found economic conditions favorable for an office-building extravaganza. With this information, new lobbying groups and neighborhood associations formed to represent the interests of developers and big real-estate holders, including major banks. The newly minted Downtown Lower Manhattan Association, for example, was a “dream team of US finance capital,” featuring representatives from Metropolitan Life, Lehman Brothers, and Morgan Stanley. The group was led by David Rockefeller himself. Powerful associations like these made inroads into politics as well, and set about “putting things where they belong,” as they’d planned decades prior. In the mid-1950s, New York had “the richest and most diverse industrial culture in the world,” Fitch argues. Its diversity of industry lent it flexibility and stability, making it a wealthy city that supported “an array of public services envied by the rest of the nation and unimaginable today,” including a university system with free tuition and a renowned hospital system. The urbanist Jane Jacobs, who lived in downtown Manhattan then, paid homage to what she called the “Hudson Street Ballet” — the way the neighborhood teemed with life at all hours due to the proximity of manufacturing and residence. The candy stores, laundromats, and “bewildering variety of small manufacturers” gave the city an unparalleled vitality. “We possess more convenience, liveliness, variety and choice than we ‘deserve’ in our own right,” she wrote. Jacobs was a staunch opponent of the Rockefeller-driven plan to eliminate the port, the produce markets and lunch canteens, and all local manufacturing from Canal Street to the Battery. She correctly predicted that the planned speculative office-building craze would spell the end of the Hudson Street Ballet, and of working-class Manhattan. For his part, Rockefeller promised that his vision of “catalytic bigness” would invigorate the neighborhood in ways his detractors couldn’t even imagine. Then rezoning began. The port was shuttered and relocated to Elizabeth, New Jersey. The manufacturing jobs left, and with them many of New York’s working-class people. The ones who stayed behind slipped from working class to poor. Office buildings sprang up, and middle-class commuters started flooding in to work professional jobs in a city still partly occupied by unemployed poor people. By the 1970s, New York City was transformed. In the mid-1970s, a financial crisis hit the city, and developers saw another opportunity to shoo working-class New Yorkers out the door. As Fitch documents, elites blamed working-class people for the crisis, pinning the city’s financial woes on its welfare-dependent population — especially black and Latino residents — whom they admonished for supposedly draining the city’s resources without offering anything in return. A new popular line began to emerge: New York had been deindustrialized; there were no working-class jobs here anymore. Why wouldn’t these people wise up, recognize there was no room for them here, and just leave? We should not encourage people to stay where their job possibilities are daily becoming more remote. Stop the Puerto Ricans and the rural blacks from living in the city … reverse the role of the city … it can no longer be a place of opportunity… Our urban system is based on the theory of taking the peasant and turning him into an industrial worker. Now there are no industrial jobs. Why not keep him a peasant? By this time, deindustrialization had swept the Rust Belt and other regions too, so a language for it was conveniently on hand. A new narrative emerged to explain what happened to New York City’s vitality and diversity. The “ineluctable forces” of the market were to blame: globalization, outsourcing, technological change, and subject-less “growth”— as though growth were as inevitable and impersonal as sunrise. City elites therefore didn’t just banish the working class, they plunged the city into a permanent condition of dependence on the finance, real estate, and insurance industries. “Of course market forces exist,” Fitch wrote. “Decentralization and global competition are not myths. But the sudden destruction of New York’s promising industrial culture of diversity starting in the mid-fifties after half a century of stability can’t be explained as an objective, impersonal process.” The people who drew the city plans that resulted in the expulsion of manufacturing weren’t indifferent actors — they were individuals with vested material interests and a specific vision for protecting and broadening those interests, at the expense of the rest of the city’s residents. As gentrification advances in city after city, and continues to discover new expressions in New York, we increasingly imagine it as a sequence of inevitable events. In doing so, we’re buying the “planned shrinkage” line that working-class people should behave as market oracles, divining trends if they’re smart, or at least following the jobs wherever they move. We forget that economic trends aren’t just abstractions — they’re actions, too, made manifest by real people with specific plans. But as surely as elite plans can be dreamt up, they can also be halted in their tracks.